What stopped me from further investigation on DIY recumbent is the suspension. Wouldn't you have the same issue ? Just wondering-from the schematics above it looks like this is going to be a FWD recumbent-and most recumbents with mismatched wheels usually have RWD ging to the large wheel for better top-end speed. The aero drag on an non faired recumbent may be the same as that of a racing tuck upright. Yes, and who would want to go to work in a racing tuck every day? Thanks! I don't know what you mean by passageways. We do have some sizeable bumps here though, and that's why I chose wide steel rims with fat (for lowracer standards) tires and hub brakes. Can you ride at 45mph with one hand?. If the front wheel were bigger I would have trouble getting my short legs around it. Trust me, i wanted to do a 406/406 or even 406/559 but it just wasn't going to work. The rear wheel can't be too tall either because I want to be able to carry a small bag on top of the cargo rack without it poking too far above my head into the windstream. Hopefully most things will fit in slim panniers in the seat's slipstream. So, I am going with the huge chainring to the smallest cog I could fit. 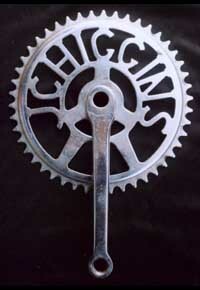 If the chainring ends up being too small (and even if it doesn't), I may end up getting a new one machined out of plate aluminum with some old school cutouts like this. Have you thought of an electric assist bike? I recently rode two different kits that were really inexpensive at only several hundred dollars. Both were in wheel motors and the improvement is massive. Just from two cordless drill batteries at 800 watts, i could fly up hills that would have me at a crawl without assist. Assisting at half the power you pedal will give a range of greater than 20 miles. No, that would ruin the fun for me. I like my bikes to be human powered only! I have a ton of things to do but hopefully will get more of these blueprints worked out! Rebuilding my mountain bike now after a minor crash and taco'd rim, and doing a big drawing for my dad and selling my car and (breathe in, breathe out) yikes. Last edited by Sven7; 09-02-2014 at 03:53 PM..
Sven, I use aero bars on my commuter and they are quite comfortable. But this is your thread. See the array of info at recumbents.com and The Bicycleman has reviews. Sorry I mean sidewalks border or shoulder maybe ? Because sometime it is required to leave the road for the sidewalk. Grant- I have a front rack that prevents aero bars, and don't like my stomach to be folded in half in a tuck. My neck also starts to hurt after looking up for a while. And I kind of just want to build a weird bike. Renault- Ah yes, we call it a curb. Usually here there is a short ramp from the sidewalk onto the road so it can be traversed somewhat smoothly. The alignment of concrete slabs varies, but if it's really bad I can just choose to ride on the road in most places. I've never ridden a recumbent on the sidewalk, so it will be a learning experience. I'm sure some technique adaptation will be necessary. Over half my daily commute is on surface roads (riding an upright), so that won't be an area of concern. The other part (a mile) is a 40mph (65kph) four lane road, where I ride the sidewalk when possible since there is rarely foot traffic. Bikes are only technically allowed on 35mph or less in Michigan and I have gotten heckled for riding on these higher speed roads- even in the dead of winter when it just snowed and it's the only passable route. Moral is, I'll ride wherever I need to ride, and motorists will be angry no matter what. Last edited by Sven7; 09-03-2014 at 12:06 PM..
Every bike regardless of design is to be careful matched to the purpose desired and the comfort of the rider. My frame, seat, and handlebars are precisely sized to accommodate my ample girth. You will find the best position to fit you and your muscles will adapt with use. If a rear suspension is not feasible at least put some type of springing under your seat. If the 65T chain ring is too big for the frame a smaller gear on the hub could let you use a smaller chain ring and get the same ratio. Either 42/13T or 52/16T will be the same ratio and should be readily available. Last edited by Grant-53; 09-03-2014 at 05:26 PM..